Commercial land at Kingston Wharf in East Cowes, Isle of Wight is available for rent at the Cowes Harbour Commission (CHC) owned waterfront site. The area for rental measures 1.5 acres and benefits from all-tide deep-water access and wharfage. 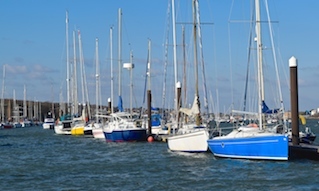 Kingston Wharf is located on the eastern bank of the River Medina and adjoins CHC’s Cowes Harbour Services Boatyard. Vehicular access is via Kingston Road. The wharf comprises a level site totalling approximately 1.5 acres. It was last used for import and storage of aggregates. The south and north boundaries are fenced and the eastern boundary comprises an embankment, with fencing above. The western edge of the site comprises the river wharf, which is 60 metres in length, with a water depth of circa 2 metres below chart datum. In addition to its direct river access, the site adjoins a bespoke hoist dock, which is served by a 40 tonne travel hoist. This is operated by Cowes Harbour Services, which is the marine services division of the site owners, Cowes Harbour Commission. Road access is via the main site road, which leads from Kingston Road. The previous occupiers used this road for the lorry movement of aggregates, which demonstrates that the site has good HGV accessibility. 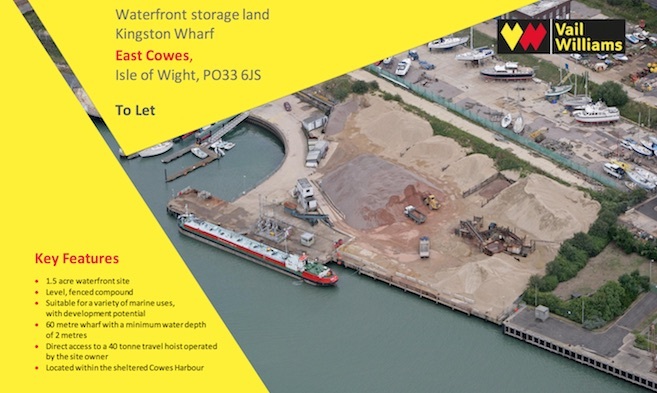 Interested parties are encouraged to view the Kingston Wharf letting particulars and to discuss their intentions with property consultants Vail Williams who can provide further guidance.